A character Reference Letter is a kind of a recommendation letter by someone who has worked with you before. The person writing the letter should be at a high post at their place of work. The letter consists of your personal traits which were observed by the person and were helpful for him to work with you. Character reference letter templates can help you in writing a character reference letter with ease and in no time. 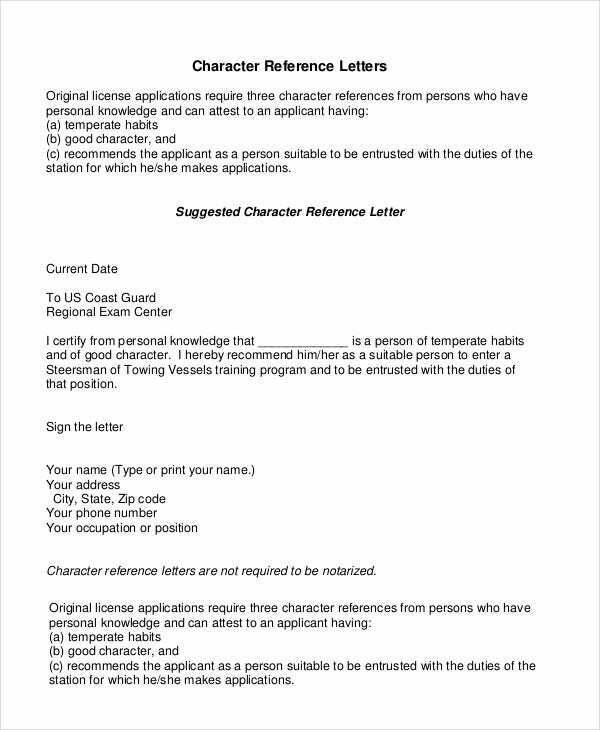 If you wish to write a character reference letter for a person who has served under you in the military then you can make use of this character reference letter example. This is a very generic character reference letter example that you can use as a reference to write a character reference letter for someone willing to join a variety of organizations. > What is the purpose of a Character Reference Letter? The character reference Letter Templates help in giving an insight of you personally whenever you apply for a post and send a resume for it. Your resume tells about you professionally, about your academic qualifications, and your work experience. 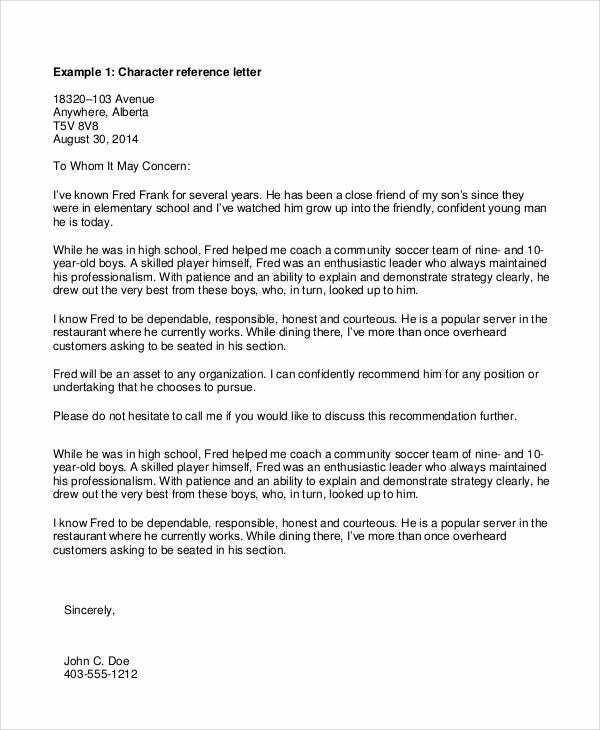 Your character reference letter tells the recruiters about how you are as a person in a working environment, how you work with other people, how you handle pressure, etc. A character reference letter also helps in other purposes like applying for immigration as it tells how you have been as a citizen for the duration of your stay which should help you in becoming a permanent citizen. This character reference letter example contains guidelines for important details that are to be covered about the person regarding whom you are writing the character reference letter along with having a sample letter. 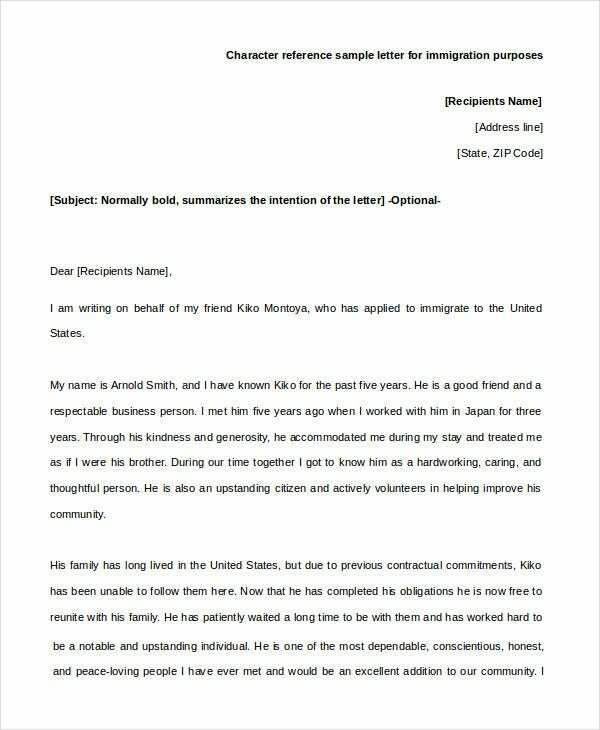 If you wish to write a character reference letter for someone who is applying to immigrate to a different country then this character reference letter example can be of great help to you. > What should a Character Reference Letter say? A character letter should highlight various personal aspects depending on the place the character reference letter is being sent to. If the person is applying for a job, the character reference letter should write about the traits the person showed while working with you and the positive things he or she brought to the workplace. You can also see Word Reference Letters. 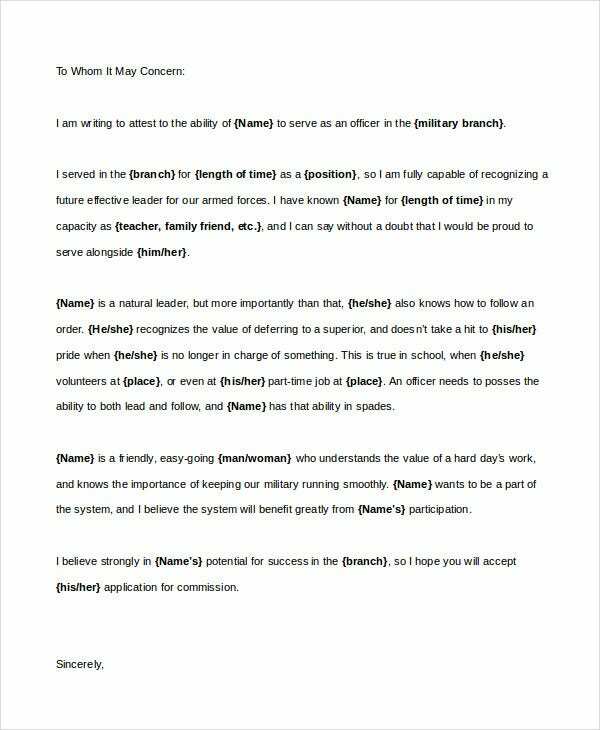 For military character reference letter, the person’s discipline and leadership qualities should be highlighted. The character letter should also include the relationship you had with the person you are writing the letter for and for how long you both were together. You can also include your contact information if someone wants to verify the letter. 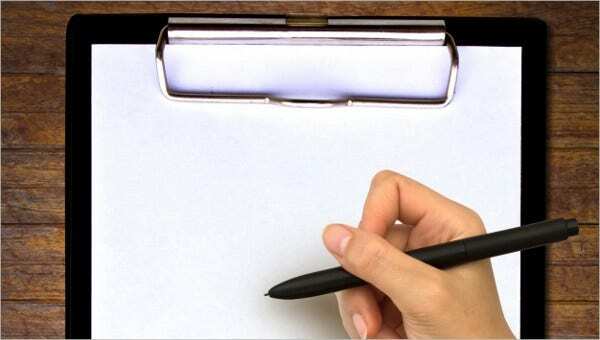 If you are not used to writing character reference letters then this example can help you in writing one as by reading it, you can understand how to write such a letter. Write in brief about yourself. This will help the person to visualize the type of person the applicant worked with and make the letter look more authentic. Put more stress on the person’s strong qualities. This will help the person with his application. Write about instances where the person saved the day. This will help in understanding the person more deeply. Write about the positive changes that were brought in the overall environment by the person. Letter of recommendation templates and employee recommendation templates are useful letter templates that can help you in writing letters of recommendation with ease. The internal link anchor text given below the descriptions will redirect you towards the letter examples which you can use for writing a character reference letter.